Moving Targets is a collaborative, multidisciplinary art exhibition by artists Ann Rosenthal and Steffi Domike with Ruth Fauman-Fichman that commemorated the 2014 centenary of the extinction of the passenger pigeon, the most abundant bird in North America that was hunted to extinction within a period of 40 years. The exhibition parallels the plight of the passenger pigeon with that of the artists’ maternal lineage, piecing together the fragmented stories and forced migrations of both pigeons and Jews. While texts, including Joel Greenberg’s A Feathered River Across the Sky (2014), provided a basis for understanding the pigeons, there was no comparable source about the artists’ own families. Thus, Domike and Rosenthal sought the help of Dr. Ruth Fauman-Fichman, who researched their family histories within the Jewish Ukrainian diaspora. 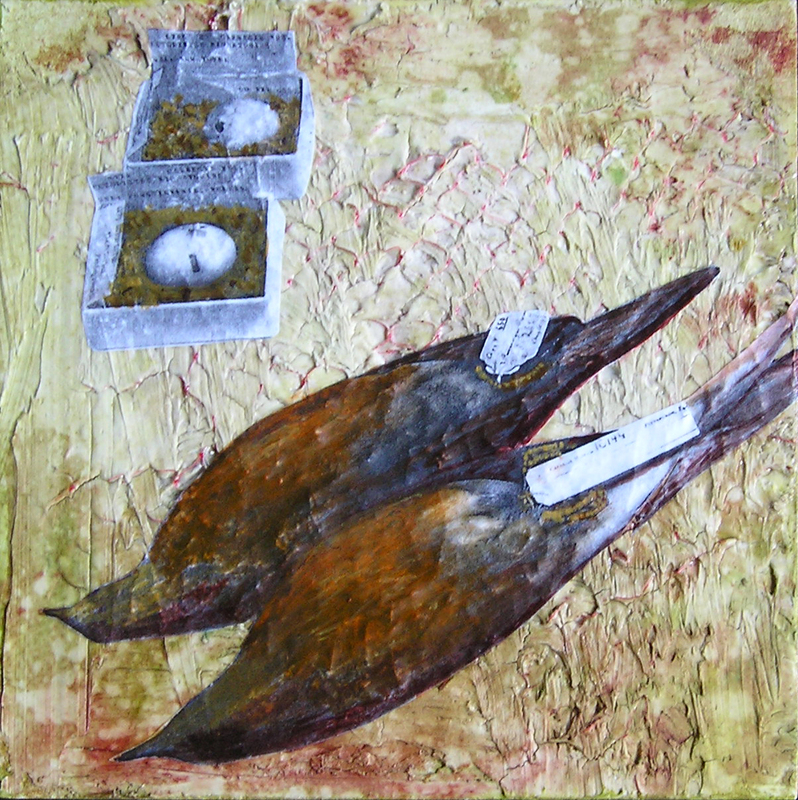 In addition to their own work, Domike and Rosenthal invited 14 artists, who each reside within the bird’s former nesting range to comprise a “Passenger Pigeon Portrait Gallery.” The Gallery included photography, collage, assemblage, digital prints, encaustic, and acrylic works. The exhibition was shown in its entirety in 2014 at the Brushwood Center at Ryerson Woods (Deerfield, IL) and Gumberg Library, Duquesne University (Pittsburgh, PA). In addition, the Portrait Gallery was shown at the Art & Environment Gallery, School of Natural Resources and the Environment, University of Michigan, Ann Arbor and at the Cornell Lab of Ornithology, Ithaca, NY. For the launch of the 2015 exhibition catalog, the exhibition was reinstalled (sans Portrait Gallery) at the Christine Frechard Gallery in Pittsburgh. See a virtual tour of the Brushwood Center installation and details of the Portrait Gallery here. We hope that Moving Targets will prompt our audience to discover where these two worlds meet, and why some communities, whether human or animal, are deemed expendable. Pingback: Moving Targets – A Reflection From A Century Passing | Patricia DeMarco Ph.D.